Radiation therapy is one of the most common treatments for cancer. About half of all cancer patients receive radiation treatment as a part of their cancer treatment plan. Radiation therapy uses high energy radiation to shrink tumours and kill cancer cells; it can be given alone or used with other treatments such as chemotherapy or surgery. 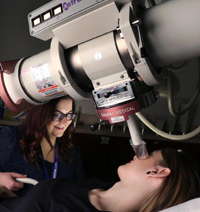 Radiation therapy in the province is provided at the Dr. H. Bliss Murphy Cancer Centre. If you need help finding a place to stay while you are in St. John’s, the cancer patient navigators and social work counsellors may be able to assist you. It is important to remember that you are the most important member of the team. 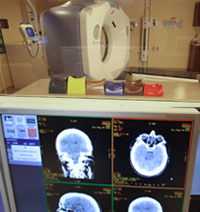 You should ask any questions that you have about your radiation treatment. High doses of radiation are given from outside the body. It does not hurt and does not make the person radioactive. 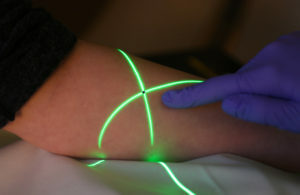 This type of radiation can treat larger areas of the body. 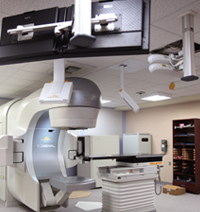 External radiation therapy is delivered by a machine called a linear accelerator. For more information, please visit: External Beam Radiation Therapy, Canadian Cancer Society. Brachytherapy is delivered using a high dose rate (HDR) afterloader. the tumour was removed. This is delivered by an applicator that is inserted into the body. Depending on the area being treated, internal radiation treatment may last five to 40 minutes. The treatment does not hurt and does not make the person radioactive. 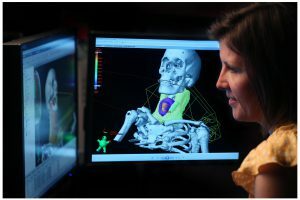 CT (Computerized Tomography) simulator is used by the radiation oncologist for planning your radiation treatment. 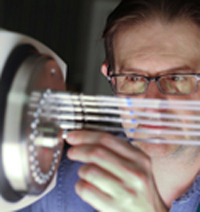 Linear accelerator machine directs beams of high-energy X-rays or electrons. Orthovoltage is used to treat areas that are close to the surface of the skin. Brachytherapy unit uses a radioactive source to treat internally. Children and parents are given a tour of the radiation department before treatment. Some children may need to be sedated so they remain still for their treatment. Children who are awake may listen to their favorite music or watch their favorite movie during treatment. If you are given instructions to prepare for your “markings” and radiation treatments, it is important to follow them. Examples of instructions include a full bladder or an empty stomach. It is important to follow the instructions you have been given on radiation side effects. Side effects may continue up to six weeks after treatment. In some cases, side effects can gradually appear over a long time, sometimes several years after treatment has ended. You will receive a follow-up appointment within six to eight weeks after treatment. If you do not receive your follow-up appointment, please call 709-777-8206. The palliative radiation oncology clinic is a weekly clinic offered at the cancer centre. This clinic is for palliative cancer patients who have cancer that has spread to their bone and/or brain who need radiation treatment quickly. Patients will be contacted and educated about radiation therapy before they get treatment. The palliative radiation oncology clinic involves a team approach to treatment and assessment. The team includes radiation therapy, palliative care nursing and physicians, radiation oncology nursing, and a radiation oncologist. Other team members may include social work counsellors, dietitians, pharmacists and lymphedema care specialists. What is the process for CT simulation (“markings”)? 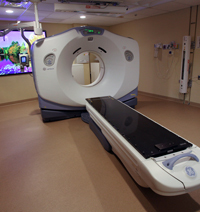 First, your radiation therapists perform a planning CT scan of the area of the body that needs to be treated. Your radiation therapist then positions you for your treatment. This is the time to let the therapist know if the position you have is uncomfortable. A treatment aid may be made to help you keep your position during treatment, for example a special cushion or face mask if necessary. You may be given small tattoos (permanent dots of ink the size of a freckle) that are used to help position you for your treatment. Your CT Simulation appointment may take 30 to 90 minutes. Please plan to be in the cancer centre for at least two hours. What is radiation treatment planning? 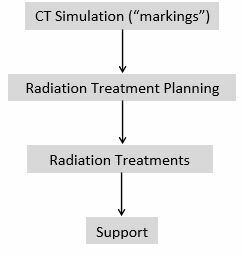 Radiation treatment planning is a process in which a team develops a plan on how to safely deliver radiation to the treatment area, while limiting the radiation to other areas. The radiation dose and number of treatments required depends on the type and stage of cancer. Each patient has their own radiation treatment plan. Your radiation oncologist confirms the radiation dose and number of treatments necessary. The body area to be treated and areas to avoid are outlined on the images from the CT scan. Dosimetrists work with your radiation oncologist and a medical physicist to design a treatment plan made especially for you. You do not need to be present for the treatment planning as this process could take several days. Treatment planning is necessary to ensure that the treatment area receives the radiation dose with minimal side effects. On your first day of treatment, you will register and receive your appointment times, and you will be taken to your waiting room. Please plan to register 15 minutes before your appointment time each day. Radiation treatment appointments are Monday to Friday. Radiation therapists will position you the same way as when you had your markings done during your planning CT scan. Images are taken to make sure you are in the correct position. 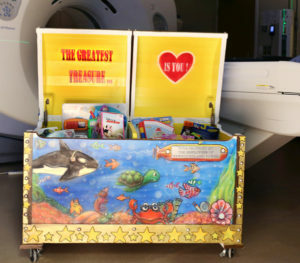 When the radiation treatment is being delivered you will not see or feel the treatment; you may hear a buzzing noise when the machine turns on. The machine moves all around you but nothing touches you. During treatment, it is important to stay very still and breathe normally. Radiation therapists cannot be in the room with you while you receive your treatment, but they can see and hear you if you need anything. During treatment delivery it is important to follow instructions from the radiation therapist.Your appointment is scheduled for 10 to 30 minutes but the actual treatment time is only two to three minutes. 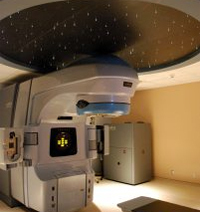 What is radiation treatment support? Your radiation therapists will see you every day during your treatment and can answer questions you may have. It is important to let the radiation therapist know if you notice changes or side effects during your treatment. You will have a weekly clinic appointment with a radiation oncologist or nurse practitioner to review your treatment and side effects. Support services, such as dietitians, oncology social workers and a lymphedema nurse specialist, are available to you if needed.